There are many ways that you can spruce up your garage. Many homeowners start with an organization process that helps them find a place for everything in cabinets and other forms of storage. Once that is completed, a new garage flooring can be put down to turn your garage into a space that you love. When you are ready to choose your flooring, here are some things you should consider. Before you choose the flooring material you want to install inside your garage, you will want to consider what the main purpose of the space will be. A garage that will be use for a lot of projects such as car repair or woodworking will need a floor that is durable and stain resistant. However, if you are using your garage space as another living area of your home or a place to show off your collectible vehicles, you can choose a flooring that has style as well as functionality. Flooring for your garage comes in many different types of material. The material you choose will be determined by the wear and tear you expect with your daily functions inside the garage, as well as the installation process. The two most common types of flooring you can use for a garage are a rollout kind that can be cut to fit the space or an interlocking tile system that can be installed quickly. Primers, paints and stains can also be used, but these flooring types take significantly longer to complete and may need professional expertise to be installed correctly. 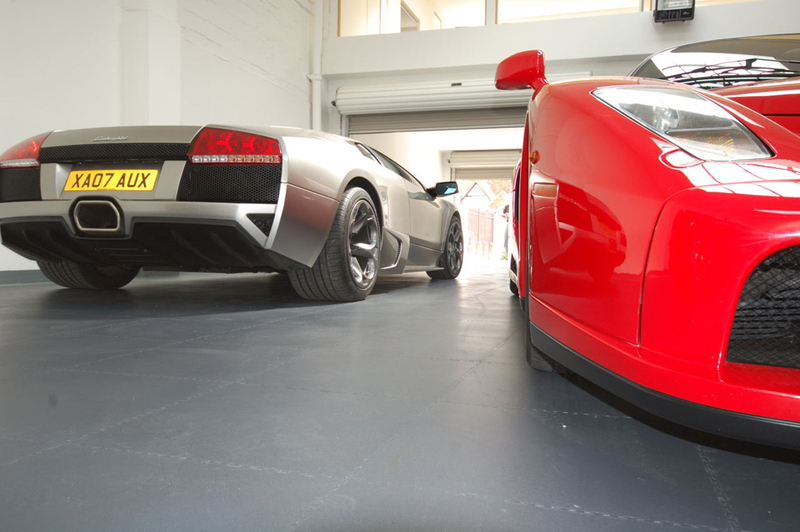 Another aspect of the different flooring materials available for your garage is how easy it is to maintain. If you are doing extensive work on vehicles, for example, you will want to choose a flooring material that is easy to clean, even when salt or oil stains collect on the floor. When your garage is more like a showroom than a workroom, you will want to make sure that the flooring you choose is easy to sweep and clean. Flooring is an essential part of turning an ordinary garage into another living space for you and your family. The right flooring will help you achieve the look you want.